The 10 Best Places for a Kid’s Birthday Party in West Virginia! Planning a birthday party for a child? You’ll find a great selection of venues throughout West Virginia that will accommodate just about any theme you have. Enjoy everything from skating and painting, to laser tag and football. Experience a birthday party in a toy museum, and places where creativity abounds. Inside, outside, your place or theirs, your next party will be a guaranteed success and memory maker with any one of these suggested places for a kid’s birthday party in West Virginia. Skate Country in Parkersburg, West Virginia, is the perfect place to have birthday parties. Young ones will have a great time here in a safe and welcoming environment, and the staff is friendly and accommodating. The music is easy to skate by and family friendly. There are so many things to do at the Clay Center for the Arts and Sciences in Charleston, West Virginia, that your creative young ones will have a hard time choosing what they like best. This 240,000-square-foot facility makes learning fun. Available for private parties of all kinds, birthday parties are especially great here. All you have to do is show up and have fun, and let the staff of the center set up and clean up, making planning your next birthday celebration a piece of cake. The Wow Factory in Morgantown, West Virginia, is a one-stop shop for kids of all ages. Parents love the choices and themes available here and planning your child’s birthday party has never been easier. There’s pottery painting, glass works, clay modeling, canvas painting and much more. Customized parties are available in a range of budget-friendly prices and can include pizza, cake, drinks, paper products, and decorations, and a craft of choice. Birthday parties have never been so much fun than when celebrated at Valley Worlds of Fun in Fairmont, West Virginia. 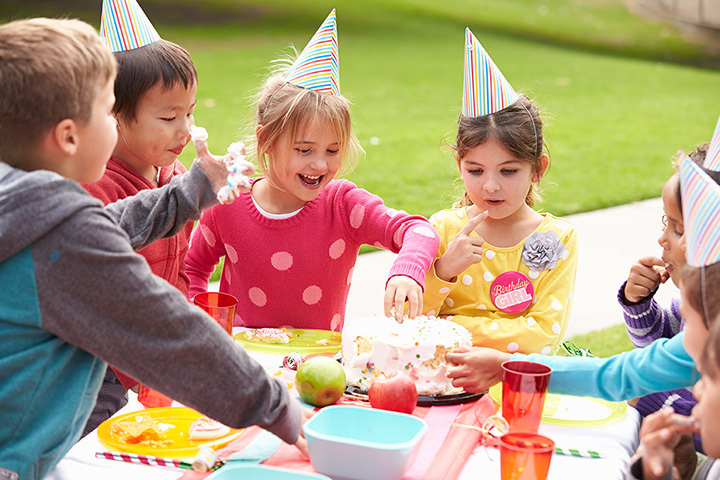 Parties have a per-person price and can include a private room or pavilion, bowling or laser tag, arcade tickets, paper products, and food, except cake and ice cream. The entire facility is tobacco and alcohol free, too. Planning a party for your young sports enthusiast? Quantum Sports Center in Hurricane, West Virginia, is the perfect venue for your celebration. Party packages can be customized in two-hour blocks of time on weekends and include your choice of dodge ball, soccer, flag football, t-ball, kick ball, or whiffle ball. Each party comes with a coach to oversee the games and reservations are highly recommended due to the popularity of this place. Specializing in nail services and face and body treatments for children and adults, Spa La La in Charleston, West Virginia, is a great idea for a relaxing birthday celebration. Cost of party includes room rental and whatever services requested on a per-child basis. Adult referees keep things fun, friendly, and safe at Scary Creek Paintball in Scott Depot, even though the name is contrary. This family-owned alternative to a traditional birthday party is challenging and playful whether you use your guns or theirs. Prices are reasonable with discounts for groups of 10 or more, and membership gives an added discount. Not sure what to do for your next birthday party? Why not host a Laser Tag Party in your own backyard? Party planners can rent all the equipment needed for up to eight players at a time, and instructions are provided for a safe, exciting, and fun event. One-day or weekend rentals are available and prices are very reasonable. What better place to have a child’s birthday party than at a toy museum? Kruger Street Toy and Train Museum in Wheeling, West Virginia, is ideal for kids and adults alike with two rooms for rent for your special event. Fully handicapped accessible, rental includes the choice of a small room that accommodates up to 40 or a large room for up to 80 attendees and museum admission for all guests. Pizza and spaghetti are favorites for kids of any age, so why not plan the next birthday party at Gatti’s in Logan, West Virginia? Gamers will especially enjoy the game room and you’ll appreciate the low prices for great food and the all-you-can-eat buffet. The minimum number of guests is eight and there are different packages available at a per-person rate.